In total, the Development Plan projects involve about 8.0 million gross square feet of new buildings. This includes about 1.95 million square feet for parking decks and 312,382 square feet for infrastructure projects. About 235,000 gross square feet of existing buildings will be demolished. This means the net increase in occupiable floor area is about 5.6 million square feet. In 2000-2001, there were about 14,200 parking spaces on the main campus. Then, like now, this was not enough for all the employees or students wanting to park on campus. There were about 8,000 spaces for about 13,000 Main Campus employees, or 0.61 spaces per Main Campus employee. The rate for students was much lower – less than 10 percent for both resident students and commuting students. Freshmen are not eligible for a parking permit. The Development Plan involves extensive changes to the parking supply. Around 4,061 existing spaces will be permanently closed, and around 5,640 new spaces will be provided, mostly in new structures. Some other spaces will be temporarily used for construction staging at various times. The net effect is an approved increase of 1,579 spaces on campus when all the projects are completed. Table 1.2 and Figure 1.2 show these net changes. In some cases, the number of parking spaces by lot and user are estimates, as the final design of buildings and landscaping will determine how many surface spaces, if any, could be retained (particularly for service and disability spaces). Visitor parking accounts for most of the net increase, reflecting the importance of accommodating visitors. However, there is expected to be a net increase of about 380 commuter spaces and a decrease of about 287 resident student spaces. The increase in commuter spaces is very low compared with expected population growth over the period of the plan. Employee numbers are forecast to grow by 69%, and student numbers by 24%. If resident and commuter parking were to continue to be provided at the existing (2000-2001) level, the overall increase would have been much greater than the approved 1,579. The ‘shortfall’ (i.e. 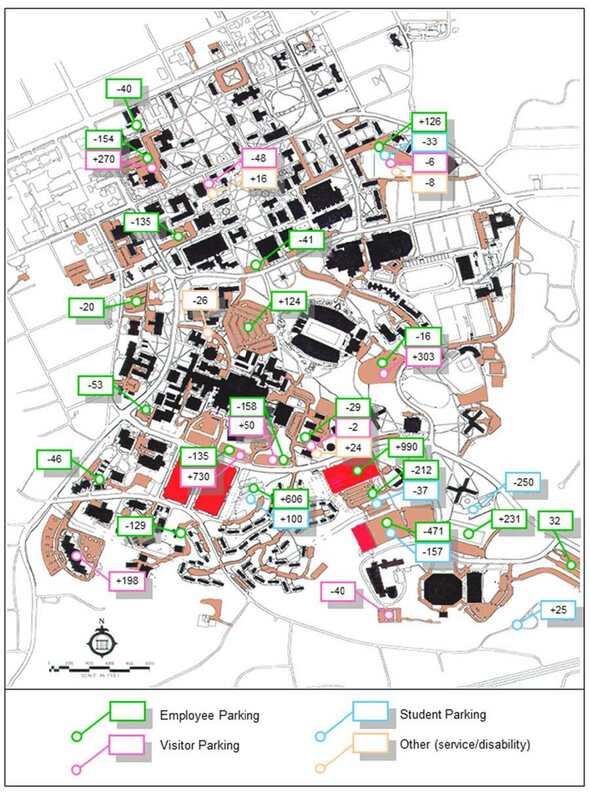 the difference between the amount of parking that would be required if parking continued to be provided at existing rates, and the amount that will actually be provided) is estimated to be 4,572 employee spaces, 423 commuting student spaces, 451 resident student spaces, and 2,107 University and Hospitals visitors. The shortfall in commuter parking will be met by alternative modes, and the Development Plan includes a range of transportation initiatives to accommodate this. The shortfall in resident student parking will be met in storage lots off-campus. The amount of traffic that will be generated by the Development Plan is a function of the amount of parking that will be provided. The limited increase in parking will therefore limit the traffic impact. The increased parking (net increase of 1,579 spaces) is estimated to generate 11,487 vehicle trips daily. A typical campus development of similar size, with unlimited parking and little or no transportation alternatives, would generate almost 35,000 trips daily. This means that the Development Plan projects will only generate about one-third of the trips that would be expected from a typical campus development of this size. *This represents relocation of planned surface parking to spaces beneath the buildings. Numbers are subject to change, depending on the final footprint of each project. These numbers represent net changes only. For example, the Rams Head structure has 700 spaces, but 413 were displaced as a result of its construction. The net impact, which is shown in this table, is 287 spaces. 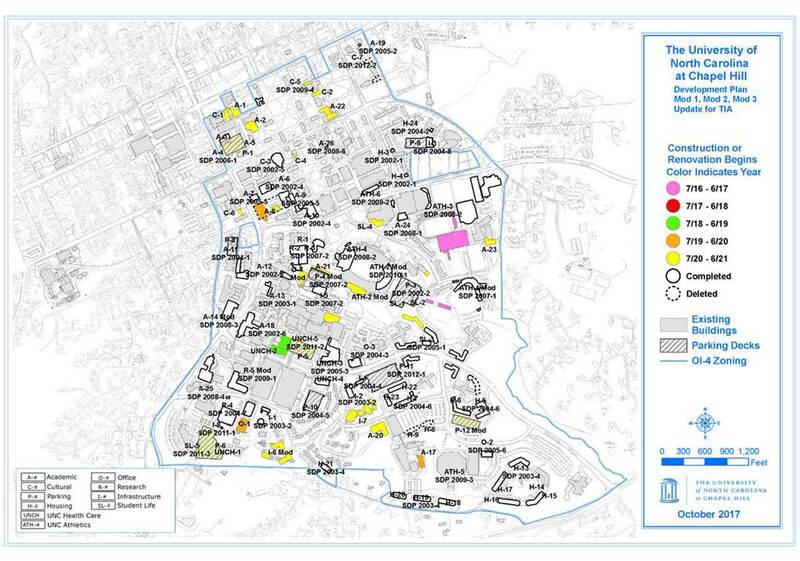 Spaces not assigned to a specific location on the campus and whose location(s) will be determined in future development plan modification requests. The total net change in parking is 32 spaces less than the approved 1,579 space increase, but the traffic assessment accounts for the entire 1,579 space net increase.